The 1970s desire to "find oneself" often resulted in people getting naked in public. The height of the streaking craze came in 1974 when a naked man zoomed across the stage during the Academy Awards ceremony in Los Angeles. Tom Wolfe called the 1970s the "Me Decade." Across the land, Americans seemed determined to escape from the wars and social movements of the previous decade. Disillusionment with national and global action led many to look inward and find solace in discovering more about themselves. A magazine entitled Self sold thousands of copies. Women demanded respect as equal partners. Fashions veered toward the outrageous and ridiculous, reflecting the glorification of rule breaking and self-expression. The sexual revolution took hold from the inner city to the small town. Therapy sessions mushroomed as Americans in all walks of life searched to find "the real me." 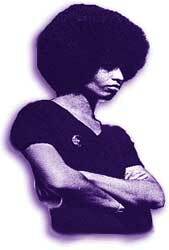 Many during the '70s wore the "afro" hairstyle simply as a fashion statement. But to others it signified a shift toward more aggressive expressions of African American identity. Every rule of fashion was shattered in the 1970s. Lapels, ties, and collars, reached record widths. The polyester leisure suit, available in a palette of citrus and pastel colors, was extremely popular among young males. The jacket, pants, and vest were often worn with an open collar to display thick necklace chains nestled in exposed chest hair. Hair was large and long for both males and females. Afros proved popular. Sideburns were long and bushy. Bellbottom jeans and hiphuggers were the rage on many college campuses in the early 1970s. Platform shoes, which sometimes added as much as a foot to a person's height, were introduced. Despite the machinations of the fashion industry, skirts remained short for much of the decade, and the string bikini shocked or delighted millions on America's beaches. In the late 1970s big name labels become appealing as thousands of Americans rushed to purchase expensive designer jeans. 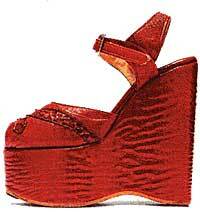 The platform shoe was just one of many fashion fads of the 1970s. Some platform shoes were so high that they increased the height of the wearer by a full foot. The sexual revolution had its roots in the 1960s, but this trend moved from the college campuses to the average American household in the 1970s. Birth control was more widely used, and young people experienced more sexual partnerships with different people. Venereal diseases became much more widespread. As women asserted themselves economically, socially, and politically, the idea of remaining trapped in an unhappy marriage became less and less appealing. Consequently, the divorce rate soared. An 1974 book entitled The Courage to Divorce encouraged individuals to put their own happiness above that of their spouses and children. 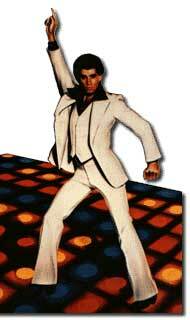 With his leisure suit, bellbottoms, gold medallion and platform shoes, John Travolta brought disco culture to the big screen as "Tony Manero" in the 1977 film Saturday Night Fever. Nowhere was the self-indulgence of the 1970s more evident than in the fads of the decade. New forms of therapy were introduced to help a person find oneself. Disco music and the disco scene capitalized on the widespread desire to forget daily troubles and just have fun. Temperature-sensitive mood rings were a bogus attempt to display inner feelings outwardly. Public streaking showed a desire to break society's norms and to show comfort with one's own body. The height of the ridiculous was reached in 1975 when an entrepreneur named Gary Dahl sold common rocks to thousands of Americans advertised as the pet rock. These "pets" were peddled with accessories and guidebooks, incurring the wrath of cultural critics across the nation who believed a new low had been reached. Whether Americans were searching for meaning, escaping from the daily grind, or simply looking for a good laugh, the 1970s marked the height of self-expression, mixed with a healthy dose of absurdity and poor taste. Yet another 1970s fashion site that begs the question: "What were these people thinking?" You'll find a wide variety of shows, boots, sandals and heels at this particular page that invites you to get a closer look at some of yesterday's popular footwear. There's also a bit on how 70s pop culture — like Wonder Woman and Elton John — made shoes the focus of fashion. American cultural history is rife with silly, goofy and sometimes downright stupid fashions, toys or events that fall into the category of "fad." Usually short lived but widespread, fads like bellbottom pants, pet rocks and mood rings abounded in the 1970s. Visit this online museum for a look at fads from throughout American history, but keep your eyes open for 70s era goofiness. There was a lot! How long does it take to teach a rock to fetch? It took Gary Dahl two weeks to write the Pet Rock Training Manual. Hustle your way on over to Des Moines, Iowa, for the annual Leisure Suit Convention. Maybe your polyester duds will fetch the "Most Flammable" award?